Joy Division were a British rock band formed in 1976 in Salford, Greater Manchester. They were originally named Stiff Kittens (2), then changed their name to Warsaw (3) and finally became Joy Division before recording and releasing their first 7" EP "An Ideal For Living". 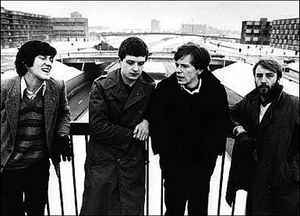 Ian Curtis (vocal, occasional guitar), Bernard Sumner (guitar, keyboards), Peter "Hooky" Hook (bass guitar, backing vocals), and Stephen Morris (aka "The Human Drum Machine") (drums, percussion). Shortly after the suicide of Ian Curtis on the 18 May 1980 –following troubles with grand mal seizures (a form of epilepsy), depression, and other contributing personal factors happening in his life– the band was renamed New Order, following a pact between all four members made long before Curtis's death that should any member 'leave', the remaining members would change the name of the group. No other band came close,most influential band sice '79!the last vagabonds in contempary music. Back in the late 70's/early 80's the term "new wave" was used in a general sense for any modern, non-mainstream rock that wasn't punk. In that sense JD was a new wave band, as were bands like Talking Heads, U2, and most of the acts that showed up in something like "Urgh: A Music War." As time went on, "new wave," like "alternative" and "indie" became such a broad term that it was almost meaningless. Put it this way: if you called something "new wave" in 80 or 81 most people knew what you were talking about. By 84 or 85 that was no longer the case. And can we put a stake through the heart of the word "genre"? It's the most overused term in all of pop music; I absolutely hate when you recommend a band or artist to someone and their first question is "What genre is it?" The correct answer is "Who cares?" The only thing that the word is good for is to make internet searches easier. Otherwise, it's totally vacuous. Love the admiration of the commenters here..... those negatives too,as that is the chemical for cult-ivation of a true iconic band that left the biggest imprint of music.forever grateful towards the band-itts ! One of the most influential bands of all time, Post-Punk never die! In Italy we called this music DARK, long before gothic or darkwave or post-punk or whatever. For some reasons i find it appropriated. Time destroyes, death conserves. And so, back in 1981, Psychedelic Furs were considered from a lot of people the most interesting thing. It seems they (and Echo & the Bunnymen too) could build the bridge to put togheter the best sixties art music and dark (or post punk or new wave or..). Time destroyed PF reputation but at the meantime Unknown Pleasure and Closer got about 150 reissues while i'm writing. Sure Ian Curtis would has never believed it. JD knew the quality of their music, but in 1980 they had no one only reason to think they could be remembered in the future just a little bit more than a cult status band. Legendary, admired, heroic and visionary, yes - sadly, the over-exploitation of Joy Division to the present day is just becoming sickening, degrading the group's legacy to the point of overrated-ness. I think all records/releases after 1980 should not be listed in "Albums"! Joy Division is not new wave band what the hell are people talking about. They are "post punk".